This is the Graduate Hotel in Athens, Georgia, home of UGA and over 36,000 students. The idea behind the hotel concept is smart as it offers out of town visitors, of which there are many, a better option than the typical chain hotels found around a University and celebrates the best of that community through local food, design and culture. Here in Athens, which is also a large music town, local bands play live in their very own hotel music club. And with rooms averaging $120 a night, it's a fantastic deal. The rooms are a wonderful mix of colors and patterns with a preppy vibe. As college towns tend to be fresh and vibrant, the design aesthetic is too. You'll find Georgia pine green walls, collegiate tartan pillows, a framed chalkboard that has a chemical equation for sweet tea. I personally love the tv cabinet which features six vintage inspired oil portraits of individuals that represent the local southern communities. This is the Graduate Hotel in Charlottesville, Virginia, home to the University of Virginia with over 21,000 students. As Charlottesville is a town steeped in history, the designers mixed traditional American and colonial motifs with replicas of vintage furnishings and a bit of modern design. The tv cabinet is covered in the silhouette style of the Jeffersonian era but with figures of local celebrity residents or former students, like Dave Matthews, Tina Fey and Sissy Spacek. And this is the Graduate Hotel in Oxford, Mississippi. It feels the most Southern and I must admit, it's the one I want to see in person the most. Ole Miss is the popular University here with over 23,000 students. At this location, which is an ode to famous writers and Southern musicians, they also have a rooftop bar with live blues bands and classic cocktails. And how can you not love bubblegum pink floors? It makes me think of how many times I shake my head at bad, ugly carpeting on floor after floor of the standard hotels I've stayed at that lack any semblance of thoughtfulness or personality or charm or welcoming feeling. Can you tell I'm bitter? Well a pink floor is certainly the perfect antidote to that. Learn more about Graduate Hotels, which includes locations in Wisconsin, Arizona and Michigan as well as soon to open locations in North Carolina, Nebraska, Virginia and California, here. Last month, I met Garrett Hilgendorf at an event at the Brick + Mortar shop in Atlanta. My friend Matt introduced us as Garrett was just days away from launching his first men's fashion collection, along with his business partner Jonathan Ruane, under the name, Elk Head Clothing. Garrett was wearing a couple of his pieces and without any bias, I thought- now this would make a perfect Manly Monday post. My favorite of Garrett's pieces are his Oxford Popovers, available in both blue and indigo. 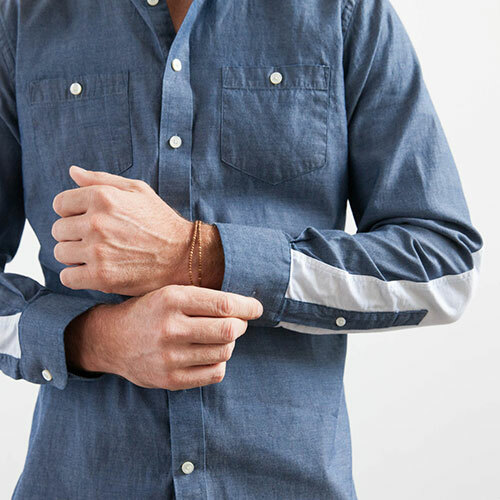 With just a few buttons and a pocket (or not), they blend dressy and casual quite seamlessly. The line is beautifully made and well priced. Elk Head shirts range from $98-$118 and the trousers are $148. Garrett refers to his collection as casual and rugged, a result of growing up in Michigan as an avid outdoorsman and hunter. I'm just happy he's now here in Atlanta, sharing his skills and cool, modern aesthetic. I love a good shop. Which is the best way to describe Amelia in Oxford, Mississippi. This lovely, charming and beautifully designed home goods and gift store is what's needed in every town in America. It's one of those places that just make you happy to be there, surrounded by pretty, thoughtful things. My favorite shops are always the ones that surprise me with products I've never seen before. Owner, Erin Austen Abbott shares her winning philosophy, "As a child it bothered me when someone else had the same shoes or shirt as myself. I didn't feel as special. 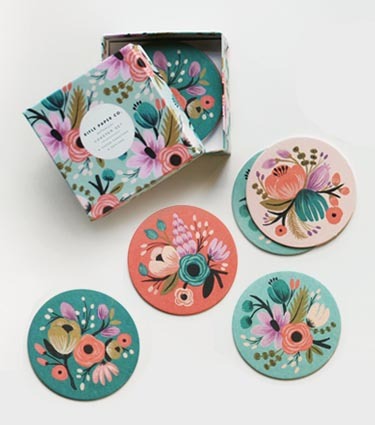 I try to get items in smaller quantities so that you too can stand out from the rest and have that unique style all your own." I love this tote bag that is a map of Oxford with an arrow pointing towards Amelia. Great design and what a smart and creative way to promote the shop. 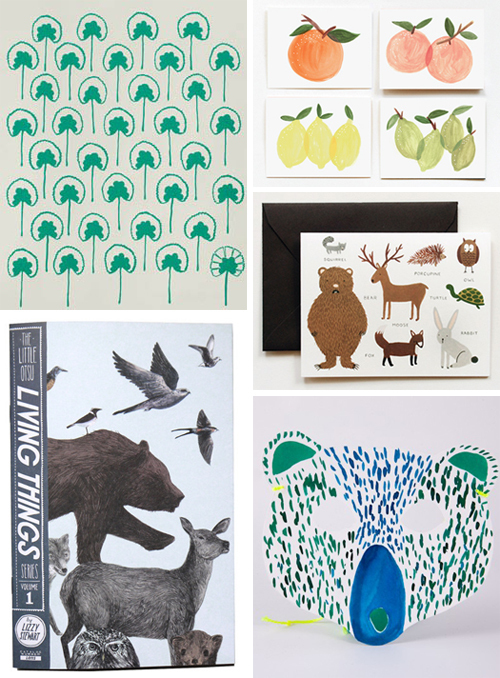 I tend to love any design items that cater to mother nature so I was happy to see that Erin stocks an array of prints, cards, books and art that celebrate the natural world. I've been seeing these fabulous Forage bowties in the press lately. All are handmade using vintage fabrics and offer a unique look for the modern man. I mean, at the end of the day, who can resist a nice guy in a stylish tie?